This website features extensive tourist information for Exmoor visitors and holiday makers, with in-depth content and pictures. The site also contains hundreds of weblinks (indicated by ) to tourist-related businesses & organisations in the Exmoor National Park. for local tourist information or use the menu left for specific interest. The Exmoor National Park is a large beautiful and peaceful area of wild countryside in the South West of England. The Park was designated in 1954 and covers 267 square miles (692sq.km.). Two thirds of the park is in the County of Somerset and one third is in Devon. The landscape is described as 'semi-natural' as it has been influenced by human activity over thousands of years. At the end of the Ice Age (10-12,000 years ago) the climate improved and vegetation began to grow. It is believed that 8,000 years ago the majority of Exmoor was continuous oak woodland. As man began to settle, the Exmoor landscape changed as agricultural 'technology' and ways of life evolved. The result of this human interaction is the wonderful diversity and variety that is Exmoor today. Exmoor has spectacular panoramic views and places for everyone to sit and enjoy them. There is an abundance of wildlife - some of which is unique to the area. 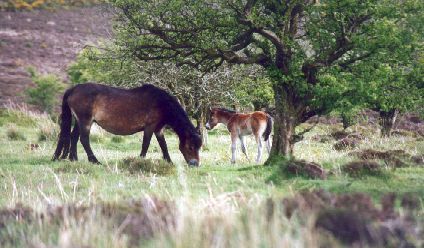 The famous Exmoor ponies are easily seen grazing on the commons. There are large numbers of wild red deer, which are more secretive, but can be seen with patience. In the late autumn during the rut, the stags can be heard roaring in the wooded valleys - a very eerie and distinctive noise. There are many rivers and deep wooded coombes on Exmoor. There are hundreds of miles of footpaths and bridleways. Canoeing on the rivers Exe and the Barle is very popular. Exmoor is a mecca for mountain bikers and walkers. Horse riding and pony trekking are also very popular. Hunting with hounds has been a traditional recreation on Exmoor for centuries. There are foxhound packs, staghound packs and beagle packs. Game shooting is a big business on Exmoor, attracting shooters from across the world. Pheasants and partridge are raised by the thousand every year, and released into the wild. Visiting drivers should take care as they often wander all over the roads in places, apparently oblivious to the danger! There are a large number of holiday cottages, B&Bs and some delightful old hotels. The whole Exmoor region relies heavily on tourism for its income, so visitors and holiday makers are well catered for and respected. What does Exmoor look like today ? High rolling moorland. Approximately 27% of the Exmoor National Park is actually 'moorland'. The rest is mainly farmland. Both the heather and grass moors are internationally important for their wildlife and scenic beauty. High ground of this nature is unusual in southern England. The Exmoor 'plateau' is an area of unglaciated upland (250-500m) approximately 200 million years old - some 180 million years older than the Alps in Europe. It is thought to rank among the oldest features on the Earths surface. A rugged coast. 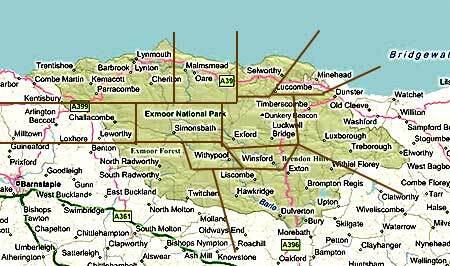 Exmoor's northern boundary (34 miles/54km) is the Bristol Channel and stretches from Combe Martin to Minehead. The cliffs along this coastline mainly face North or NE and are protected from the prevailing South Westerly winds. They are the highest cliffs in England (Great Hangman is the highest sheer cliff at 800ft/244m). The sheltered aspect has allowed the development of coastal woodland which is predominantly oak. The woods between The Foreland and Porlock represent the longest stretch of coastal woodland in England and Wales and run right down to the shore in many places. The rare Exmoor 'hogs-back' cliffs are dramatic and awe-inspiring. The Exmoor coast is one of the most unspoilt and best protected stretches of coastline in England and Wales. Ancient woodlands. Much of Exmoor's high ground features steep, woodland covered valleys (called combes). Much of the woodland is ancient sessile oak. Birch, beech, ash, rowan, unique varieties of whitebeam and various 'thorns' also feature. Rivers and streams. The very nature of the Exmoor area has determined that the only farming possible on the high ground is sheep or cattle grazing. So there is very little to pollute Exmoors watercourses. The relatively fast flowing brooks and streams support a wide variety of plants and animals, including otters, kingfishers, goosanders, salmon and trout (see fishing). The ‘Cultural’ Landscape. Dotted across this wild, 'natural' place are the farmsteads, villages and hamlets where the people who have shaped Exmoor have lived and worked for generations. Exmoor is made up of sedimentary rocks (grits, siltstones, sandstones, mudstones) which show a slaty cleavage; the rock has been altered under pressure so that it is split into flat plates. They are mainly of Devonian Age. They are special because they show an uninterrupted sequence through the Devonian into the succeeding Carboniferous period (385-355 million years ago). Devon and Exmoor was the first area where rocks of this age were studied - hence the name. Unusually smooth and convexly rounded hillsides are a special Exmoor feature. The Hogs-back cliffs owe much of their shape to weathering and erosion during the Ice Age. Changes in sea-level are responsible for other landform features such as the Valley of Rocks (Lynton), the coastal waterfalls, the Lyn Delta, the cobble or shingle ridge and submarine forest at Porlock (see top picture). 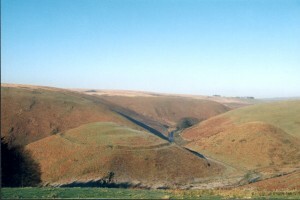 There are unusual knolls within inland valleys such as Cow Castle (beside the river Barle below Simonsbath), Flexbarrow and Alse Barrow which appear to be fragments of river terraces. 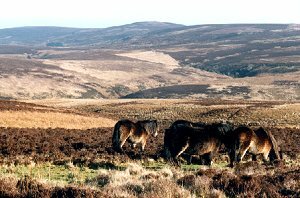 Exmoor contains 5 broad types of habitats which are recognised as being of international importance; blanket bog, upland heath, western heath, western oakwoods and parkland. The UK has 10-15% of the worlds blanket bog and wet moorland and a large proportion of its upland and western heaths. Exmoor has a significant proportion of the UK and world total of western oakwoods. Bristle bent /western gorse heath. Exmoor is thought to have two endemic species of whitebeam tree (Sorbus subcuneata and Sorbus Taxon D). (These are native to Exmoor and found nowhere else). Lichen Opegrapha fumosa is also thought to be endemic to Exmoor. Internationally endangered species found on Exmoor include; many species of spiders and insects, including high brown fritillary and heath fritillary butterflies; 10 species of bat; otter; water vole; brown hare; dormouse; goshawk; merlin; peregrine; red grouse; grey partridge; quail; curlew; guillemot; barn owl; redshank; Dartford warbler; razorbill; nightjar; Cetti's warbler; sedge warbler; lapwing. Plants include the whitebeams, Babington's leek, fragrant evening primrose and six species of fungi. red deer, whinchat, stonechat, Irish spurge, ivy-leaved bellflower, alternate water milfoil, Cornish moneywort, the 'sausage' lichen Usnea articulata, lichens Rinodina fimbrata and Rinodina flavosoralifera. These are unusual features both nationally and internationally and are confined to the West Country (Somerset, Devon and Cornwall). 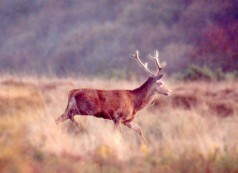 They feature widely on Exmoor as field and common boundaries. They consist of a bank of earth, typically 1-2metres high with a hedge growing on top. Sometimes the sides of the bank have 'ditching' - faced with stone which varies in character across the Moor. 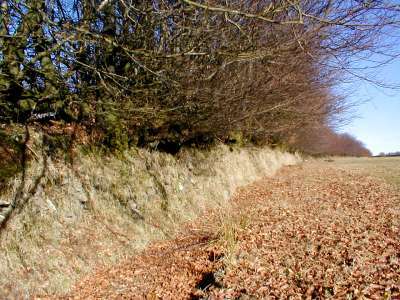 In the early 19th century the Acland family (landowners with a huge estate on the Moor) experimented with various forms of hedge to top the banks and found that beech was the most successful. Beech grew higher on Exmoor than elsewhere, was of low logging value so the locals left it alone (!) and when thinned and layed, formed a good wind and stock proof barrier. The Knights (see Simonsbath) used beech extensively in the mid 19th century during their huge moorland reclamation project. There are 162 Scheduled Monuments and 1011 Buildings of Special Architectural or Historic Interest (Listed Buildings) on Exmoor. Monuments include prehistoric remains such as standing stones, stone circles, barrows, forts and later, packhorse bridges. An unusual feature on Exmoor is the continuity of settlement in some places from the Iron Age onwards. Grade 1 secular Listed Buildings on Exmoor are:- Bratton Court, Combe Sydenham, Dunster Castle, Dunster Yarn Market, Gallox Bridge, Nettlecombe Court, Tarr Steps. Grade 1 Listed Churches on Exmoor are:- Culbone, Dunster, Luccombe, Monksilver, Nettlecombe, Porlock, Selworthy, Timberscombe, Winsford, Wootton Courtenay, St. Petrock':s at Parracombe. The Exmoor National Park is the place. The Exmoor National Park Authority (ENPA) is the organisation that is charged by central government to administer the policies and legislation the refers to National Parks in the UK. ENPA is a 'free-standing' body within the local government structure, but independent of County and District councils. The Authority meets on a regular basis to decide policy, resource allocation and planning issues. How is the ENPA Funded? 21% self generated, including additional funds from external sources. 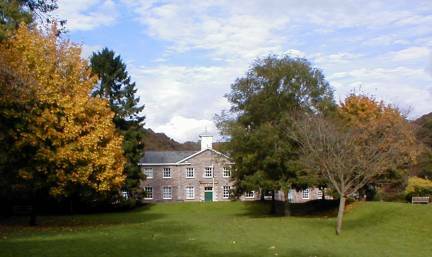 The ENPA headquarters is Exmoor House, Dulverton, Somerset, TA22 9HL.